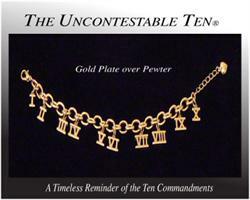 MonsterCommerce Shopping Cart - "The Uncontestable Ten"
Home > "The Uncontestable Ten"
A Timeless Reminder of the Ten Commandments. 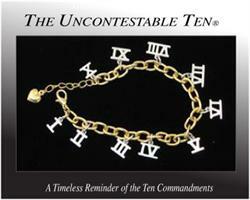 Elegant jewelry suite of both necklace and bracelet available in three popular finishes: Sterling Silver, Two-Tone (quality gold plate bracelet links with Rhodium plated numerals), and all yellow Gold Plate. 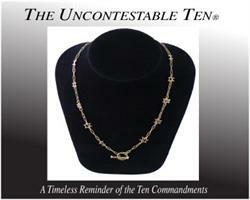 Neckace: Delicate with front toggle clasp / 18" length. Bracelet: Chunky chain with heart dangle at the end of the extender. One size fits most: 6.5" to 8".